The original bill that established the state’s greenhouse gas reduction program, AB 32, passed in 2006 and authorized the California Air Resources Board (CARB) to monitor and regulate sources emitting greenhouse gases. The initial target was to reduce emissions to the 1990 level by 2020. An executive order from California’s governor targets an 80% reduction from 1990 levels by 2050. From 1990 to 2015, California’s GHG emissions from the electric power sector were reduced by 24%, the largest percentage decline among sectors. Over that same period, commercial and residential sector emissions fell by about 14%, and industrial emissions fell by 13%. Transportation-related emissions declined from 2007 through 2013, but they rose in both 2014 and 2015. California’s GHG emissions from agriculture and other uses, although smaller in magnitude, have more than tripled since 1990. Overall, California’s total GHG emissions were 2% higher than 1990 levels as of 2015. In 2016, CARB released a scoping plan for the 2030 target that involved continuing existing programs such as the Low Carbon Fuel Standard (LCFS) program and the state’s renewables portfolio standard. The LCFS program aims to increase the use of biofuels in the transportation sector. California’s renewables portfolio standard sets targets for specific technologies used to generate electricity in the state. The transportation and electric power sectors are the two largest sources of California’s emissions, responsible for 37% and 19% of the state’s GHG emissions, respectively, in 2015. California’s emissions cap-and-trade program, launched in 2013, is one of the major policies the state is using to lower its greenhouse gas emissions. In 2015, CARB recommended tightening the program, which would reduce the amount of available emissions credits. Other recommendations from CARB include new regulations that would affect petroleum refinery emissions and double energy efficiency savings by 2030, for example. Under the current cap-and-trade program, affected emissions sources include electric generators, industrial facilities, and oil and natural gas distributors. Companies in the compliance program have the option to either purchase allowances or directly reduce their emissions. Companies also have the option to finance carbon offset credits, which are earned under a separate program for voluntary projects that lower overall GHG emissions. 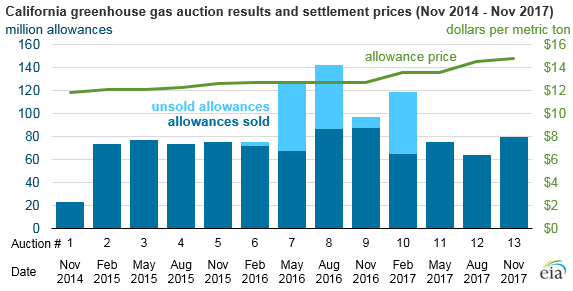 In the first auction since the passage of AB 398, allowance prices rose from $13.57 per metric ton of carbon dioxide (CO2) for May 2017 to $14.67 per metric ton in subsequent auctions for November 2017. AB 398 established new authority for the ARB to create a CO2 allowance price ceiling, set rules for the banking of allowances, and transfer unsold current vintage allowances to a reserve. California’s next auction is scheduled for February 21, 2018. In addition to its efforts to reduce greenhouse gas emissions, the legislative package seeks to reduce other pollutants. A related bill, AB 617, aims to reduce community-level air pollution from criteria pollutants such as particulates, sulfur dioxide, and nitrogen dioxide emitted by large stationary sources. This bill authorizes CARB to establish a statewide system that consults with local air districts responsible for monitoring air pollution, and it develops a statewide strategy that approves programs that reduce community emissions.